Showing results for tags 'legion of azgorh'. 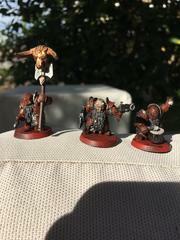 I've been out of the miniature game for a few years and just recently picked up some Chaos Dwarves from Forgeworld! So I have been slowly cleaning and preparing them and will be ready for painting soon. I see a lot of reds and lava themes online and don't necessarily want to go those routes. I've narrowed it down to two thoughts based on some images I've found online and would love to get feedback from the community here. 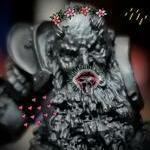 The two thoughts were the more traditional Duergar dwarves with their purple tinted skin and white beards. The other option are images of Dark Irons with their more orange hair and beards with muted colors from the WoW setting. Here are some of the things I saw and liked, what does everyone think? Starting my DZ army. Praying for Hashut's blessing. Sacrifice a slave for me. Welcome to my Legion of Azgorh blog. 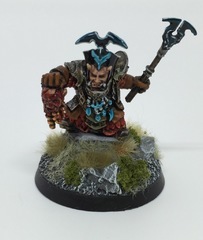 I have chosen Legion of Azgorh for my next army project mainly because I like the models but I would also like to try to make it competitive so I can take the army to tournaments and win some games. 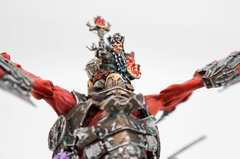 In this blog I will post VIP of my painting, battle reports and some random thoughts on Legion of Azgorh strategy and tactics. This will be a slow blog, I might play my first battle with painted models next autumn. But if you like Legion of Azgorh click follow and bear with me. I like to start with building a list and then build the army. Then I play it and that probably leads me to change the list and build and new army and then I repeat.  So here in my first post I will try to explain my thoughts around the list I am currently building. Please leave some comments that you think of it, but keep in mind that my goal is not to win at all cost. I am trying to make a competitive list that feels and plays like a Legion of Azgorh army and can win some games, so comments like keep the war machines and switch the core for Blood Bound or Skaven and add Kairos will not help me. Here is my break down of the Legion of Azgorh: On the plus side · They have great Forgeworld models. 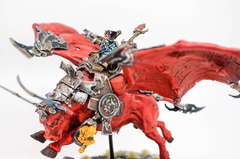 · They have good survivable war machines that are competitive prices compared to similar war machines, the Magma Cannon compared to the Warp Lightning Cannon and the Dreadquake Mortar compared to the Plagueclaw Catapult. 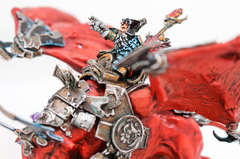 · Their battle line units are strong compared to similarly priced battle line units, for example I think Infernal Guard Ironsworn > Duardin Warriors and Infernal Guard Fireglaves > Freeguild Handgunners etc. On the minus side · They have expensive Forgeworld models. · They have almost no synergy and the ones they got are weak. · To unlock their battle line units you have to play a pure Legion of Azgorh army. · Most of the army is slow and you don’t have much to mitigate this, like for example Fyreslayer magmic tunneling. This leads me to want to build and army: · that have at least 3 war machines. · that tries to make use of the Legion of Azgorh battle line units. 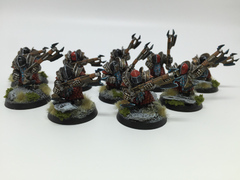 · that tries to include some fast Legion of Azgorh units. I think the best war machine in the army is the Magma Cannon by far. I also like the Dreadquake Mortar model so I would like to include it. Even if the Dreadquake isn’t as good as the Magma Cannon I think the price is ok compared to a Plagueclaw and I think the threat of landing 4D6 wounds on the opponent’s death star unit might be very useful in game even if it never happens. My hope is that it will disrupt his plans and make him put too much effort in trying to destroy the Dreadquake hiding in my backfield. 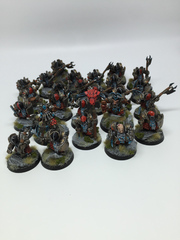 Regarding the Legion of Azgorh battle line I think the more the better but mainly because it is the most boring part to paint and I would like to try some different stuff and play a bit more aggressive I will start with 20 Ironsworns and 30 Fireglaves (probably in two units, 20 and 10). Next part is to try to make the army a bit faster. 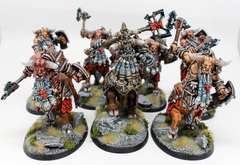 I am not a fan of neither the Bull Centaur models nor their rules so I will focus on other options. I kind of like the K’adaai Fireborns on paper (and I love their models), they are very situational but they can fly and they only cost 100pt. I think they have good value in this army to try to threaten objectives in the opponent’s deployment zone and get rid of shaft units. I don’t really think the Iron Daemon is worth 200pt but for me it composes the essence of a Legion of Azgorh army so I really would like to try to make it work in the army. I will try it and I am thinking of using it aggressively since it can be fast and it does have 11 wounds and 4+ save. The last part is Drazhoath. I can’t really justify that he costs 380pt! 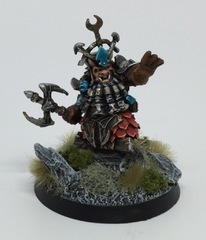 but his speed and that he is a semi-survivable hero might fill some gaps in a Legion of Azgorh army when it comes to the General’s handbook matched play missions. He can fly and try to grab some late game objectives and he is useful in three places of power. I will start with using him and maybe later switching him for more troops if it doesn’t work out. So here is the army list planning to build: 1 Drazhoath the Ashen 380 1 Infernal Guard Castellan 120 1 Daemonsmith 100 1 Daemonsmith 100 20 Infernal Guard Ironsworn 200 20 Infernal Guard Fireglaives 200 10 Infernal Guard Fireglaives 100 3 K'Daai Fireborn 100 1 Dreadquake Mortar 200 1 Magma Cannon 140 1 Magma Cannon 140 1 Iron Daemon 200 61 1980 And later if I skip Drazhoath it will probably look like this: 1 Infernal Guard Castellan 120 1 Bull Centaur Taur'uk 180 1 Daemonsmith 100 1 Daemonsmith 100 20 Infernal Guard Ironsworn 200 20 Infernal Guard Fireglaives 200 20 Infernal Guard Fireglaives 200 3 K'Daai Fireborn 100 1 Dreadquake Mortar 200 1 Magma Cannon 140 1 Magma Cannon 140 1 Deathshrieker 120 1 Iron Daemon 200 72 2000 So what do you think of my lists? 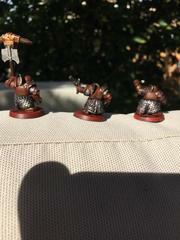 In my next post I will post some VIP pictures for my Infernal Guard Ironsworn so you can see the color scheme I am planning to use and tell me what you think of it. Quick mockup for my Chaos dwarf steam golem bull centaur conversion. Going to be covering up all of the sensors, replacing most of the hammer to match the rest of the chaos dwarf's weapons, replacing the wire with steam pipe-style tubing and adding the smokestacks from the forgefiend. Also going to be modifying the armor of the domitar to match that of the forgefiend, as well as adding horns/a new head or some fire in between the joints to emphasize it's a kadaii. 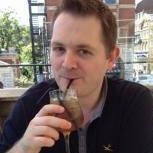 Any thoughts on modelling and/or what to count it as rules wise? I was thinking a slaughterbrute/soul grinder could work well for it rules wise, or a skullcracker. Custom rules could be cool but I'd rather not deal with any arguments. Modelling-wise my main concern is how to do the centaur body, since the forgefiend body is more insect-like and its tail isn't very animal-like. I'm also looking for possible helmet replacements, but it's tough due to the size. I'll post some actual pictures when I start on it of course! As we already know, Forge World units are not included in the upcoming General's Handbook. With the global campaign coming (assuming forge world does not release points at the same time as the handbook) I'd like to make a quick stop-gap to play with those units in matched play to try it out. I put together a sheet with Legion of Asgorh for myself, and any thoughts on it, or ideas for other forge world unit types are welcome! All point values are adapted from SCGT x20, as it's extremely close to GW's points.